For the 12th time in 30 years the Ilkeston Rescue Station won the Wynne Billiards Shield for East Midland Division Stations of the National Coal Board, this year, and formally received it at a tea and social at the Mines Rescue Station, Manners-road, last week. They won five of their six games and scored 1,785 points, with l,478 against. 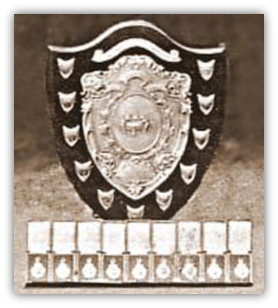 The Production Director for the East Midlands Division, Mr. W. H. Sansom, O.B.E., M.C., presented the shield. He said that he had been connected with the rescue stations for a very long time, first as a director of the Rescue Stations Company, and after nationalisation, in his present post. "I think possibly there is no one in a better position to appreciate the work that the Rescue stations have done," Mr. Sansom went on. "I know that to all of us it is a very great relief to know 'that should anything go wrong we have people of such high standard in our brigades. Those of us who have seen you on the job have wondered at the courage and efficiency with which you have always worked." Mr. Sansom expressed pleasure that the presentation had been made into a social occasion. "Life today is a little bit strenuous for most of us, and we do not get so many social occasions as we might do," he added. It was a "scandal" that Ilkeston should again win the shield, commented Mr. Sansom jocularly. He had hoped that Ashby, who were competing for the first time, would win it, but they had done very well to take second place. 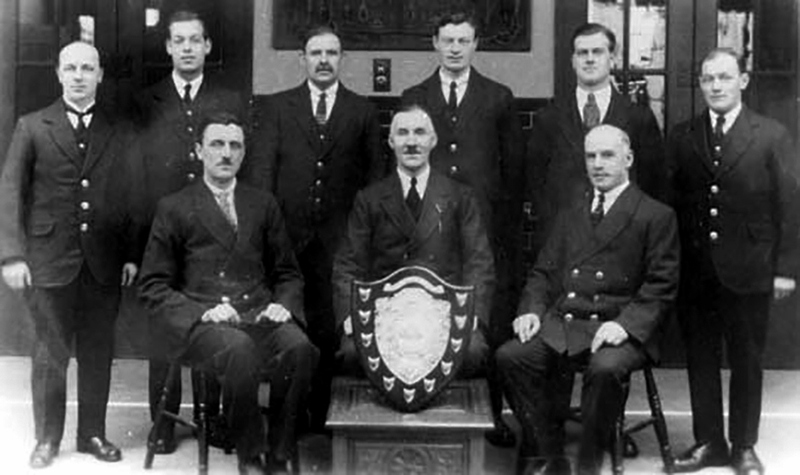 Mr. Eric Minard received the shield on behalf or the Ilkeston team,and later also received a handicap prize, together' with Messrs. A. E. Jackson, S. G. Weston, Philip Healey and L. C. Havill, also of the Ilkeston Station. Chairman at the ceremony was Mr. W. Unsworth, No.5 Area general manager, and Supt. A. Syson, of the Ilkeston Station proposed a vote of thanks to the Divisional Board and members of the local committee. Supt. D. G. Roberts, of Ashby, Seconded. Other speakers were Mr. L. G. Snape, on behalf of the Ashby Station, Mr. J. W. Kent, on behalf of Chesterfield, and Mr. P. Robinson for Mansfield. When the union chief saw the miners on pay parade he got a shock. They were SALUTING for their money. So the union chief told the Coal Board. They were shocked too. And now the saluting business has been stopped. No longer will the miners of Derbyshire's Pit Rescue Service have pay parades in Army style and salute their superintendent as they line up in his office for their wages. The union chief who spotted it is Mr Bert Wynn, area secretary of the National Union of Miner Workers. He said yesterday : "We have two mine rescue teams in the county at Chesterfield and Ilkeston. Mr. Wynn said there are thirty mine rescue workers in the county. 'They wear navy blue uniforms but they are civilians not soldiers. They do not have to salute their superintendent if they see him in the street so why should they have to do so on pay day? FIVE MEN were trapped for nine hours yesterday at the bottom of a 2,700ft. mine shaft. They crouched in darkness while, 90ft. above them, rescuers struggled to clear the shaft of broken scaffolding. Two of the trapped men were hurt by falling debris. After eight hours a telephone was passed down, then tea and sandwiches. An hour later the shaft was cleared enough for the men to be hoisted to the surface by chair. The accident happened soon after the men started work at Manton Colliery, near Worksop, Notts. They were deepening the shaft.